Travel today is a bit more like stage coach travel in the wild west. You have to be prepared for anything and everything. You may not leave or arrive on time and there’s always weather to work around. Being organized makes travel easier. 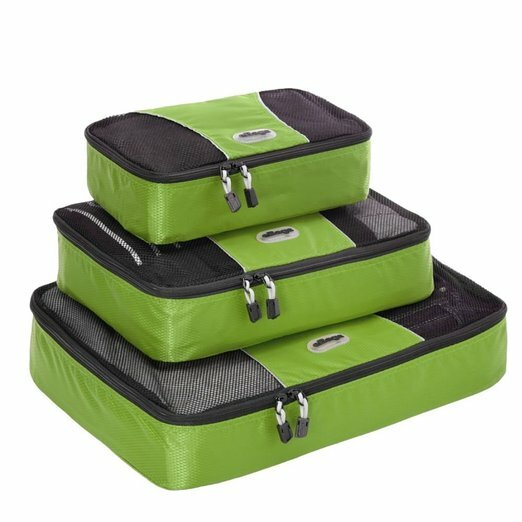 More of us are trying to be well prepared and hassle free by carrying on our luggage With all the regulations on what we can carry on, it’s great to have organizing products that make it easy to consolidate what you need. Here are my favorites for my carry on bags. With TSA requirements, liquids need a great leak proof container. 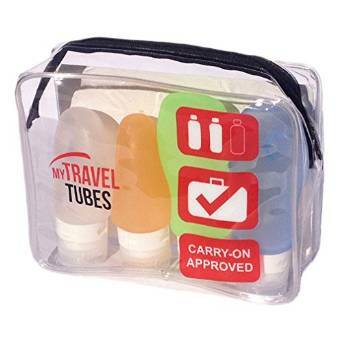 These refillable bottles travel pack has a zipper case to keep it together in my carry on. This makes it easy to pull out for going through the security line. I include my hair products, face wash and other liquids I use when I travel. 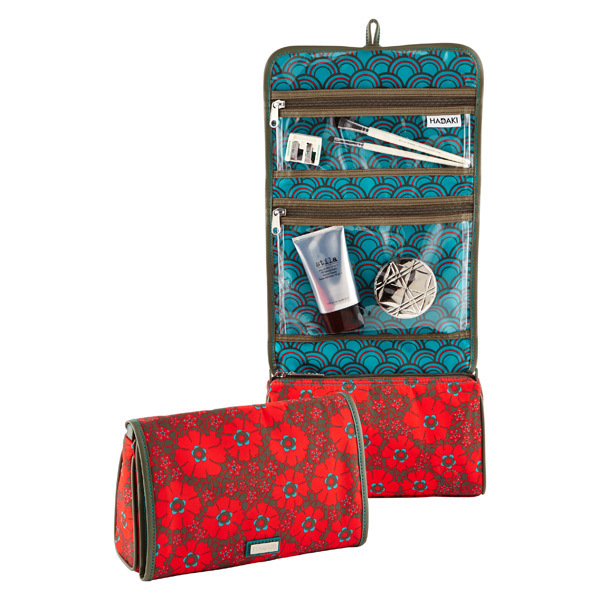 For make up and medicines, this organizing product helps you consolidate and categorize. Two clear zipper pockets hold my make up and the zipper case holds my medicine. A top hook helps you hang it at your destination. It folds into a small clutch size in your carry on. 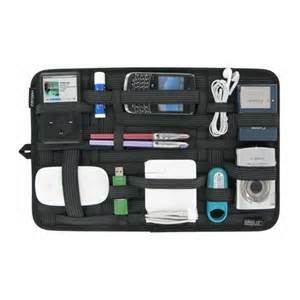 With all our cords and chargers for multiple devices, we need an a travel organizing product. The Cocoon Grid It has rubberized straps to hold cords, flash drives and other accessories in place. It zips up for easy storage. Think of your carry on luggage as a big open slot. Things slide around in there! Packing cubes consolidate and categorize your clothes, lingerie and swim wear. Cubes keep clothes neatly folded and ready to go when you arrive. Travel plans seldom follow Plan A. We want to stay in touch when Plan B happens. Having a mini charger for your devices ensures that you are always connected by your devices. Be sure to charge this ahead of time so it’s ready to use. 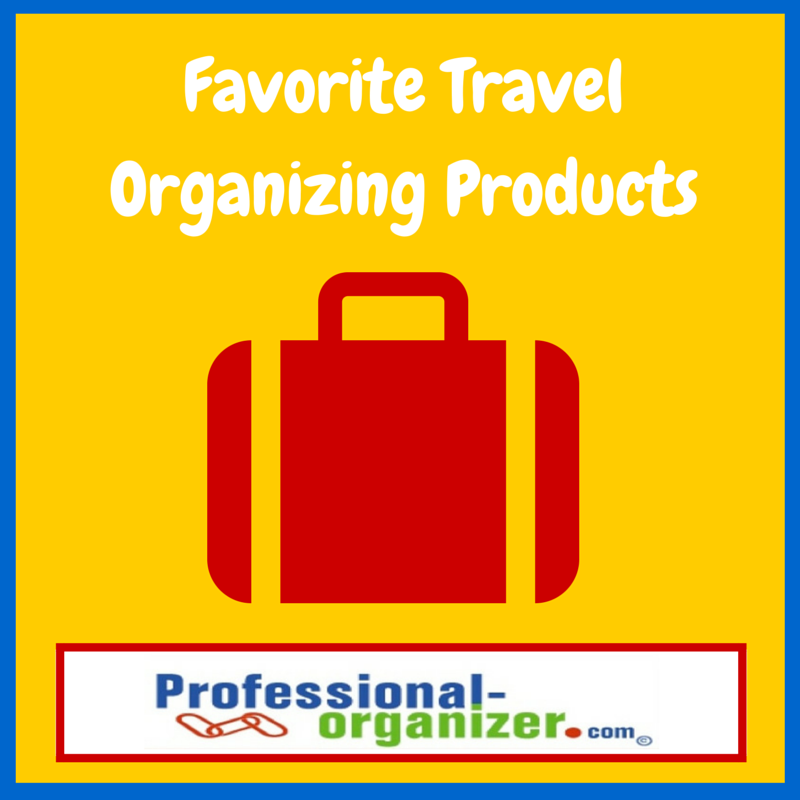 These travel organizing products are available at local big box stores, online at Amazon.com or ContainerStore.com. Purchase these well ahead of your travel date to be sure they arrive on time. 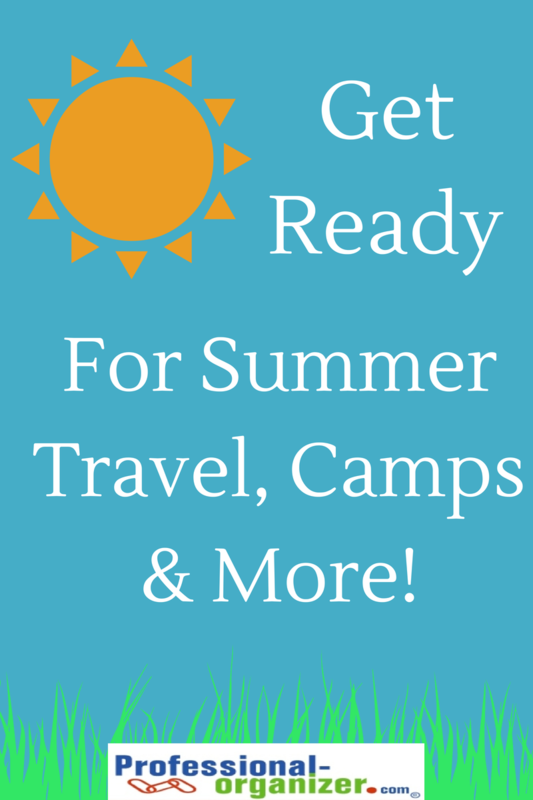 Spend a few minutes the week before you travel setting up your travel products so you are ready to go. Pack your bag to be sure they are fit properly in your current carry on. When you return home, reset with all products needed. 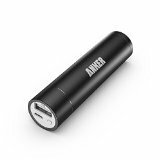 Store these in your carry on and you are ready for your next trip. Wishing you a fabulous and organized time on holiday! More tips and tools here! Join my newsletter! Weekend Warriors: Taking Care of your Car: My Vehicle’s Glove Box is Full of Paper! Help! This is the fourth in a series about “Weekend Warrior: Organizing and Taking Care of your Home and Car.” This guest post is by Lynn Beckwith, owner of Beckwith’s Car Care, sharing ideas on what papers to keep in your glove box. Our glove boxes become miniature filing cabinets over the years as we continue to add copies of vehicle registration, inspection forms, maintenance receipts, repair receipts, and miscellaneous purchases. Just like any filing cabinet, they frequently need to be purged. So, what should be kept? Keep your owner’s manual. It is a handy guide to understanding everything from the type of oil you should use to what that crazy little light on your dash means. Keep only the current vehicle registration and insurance card. Many of us tend to put the new one in and leave the old copy too, just in case we ever need it, loose the new one, or some other reason. Guess what, they are expired, no good . . . chunk them! When it comes to your maintenance receipts, you have two choices. The first option is to keep all of them. When it comes time to sell your vehicle this proof of maintenance goes a long way towards comforting the buyer that they are making a good decision. Proving that proper maintenance has been performed can also be important when dealing with factory and extended warranties. Of course, I am assuming that you have maintained your vehicle on schedule. If you have not maintained your car properly, then toss them. Proof of lax maintenance is not going to help you out. If you are keeping your car forever, these records can help you stay on top of your scheduled maintenance. The second and best option is to utilize a repair facility that will keep all of these records for you, even better if you can access them on-line when needed. Whether you have a fleet of one vehicle or many, a quality independent automotive repair shop should keep your records and help remind you when maintenance is due. The repair receipts should be kept at least until the warranty on the repair runs out. This applies to everything from alternators and batteries to tires and water pumps. Even if your repair shop keeps these on file for you it is a great idea to keep them in your glove box in case you are traveling. High quality independent repair shops offer a nationwide warranty and your receipt should have the contact information listed on it. Theses receipts can also be helpful when selling your vehicle because some components tend to fail in cycles. A recently replaced part could help assure that it will not be needed for a while. So, whether you are selling your car or keeping it forever it is a great idea to keep your paperwork in order. If nothing else you won’t have to fumble for your registration the next time you are pulled over. Look for a shop that will help you develop a customized maintenance plan that takes into account your vehicle specifications, your driving style and your budget. Find one that will help you stay on schedule with reminders and maintain your records for both warranty and re-sale purposes. The staff at Beckwith’s Car Care specializes in developing customized maintenance plans that have kept their customer’s vehicles safe and dependable for over 20 years. The Better Business Bureau has selected Beckwith’s as not only the best repair facility in the Houston metropolitan area, but also as the recipient of their Ethics award. The award winning staff includes one of the 2011 Top 20 automotive technicians in the nation. Lynn Beckwith is committed to the automotive industry. Watch for her features on Fox 26 and visit the archived videos on-line. She can be reached at 281-540-2000 or you can email your automotive questions to help@thatcarlady.com. Please visit her blog at www.thatcarlady.com or on facebook at www.facebook.com/thatcarlady. 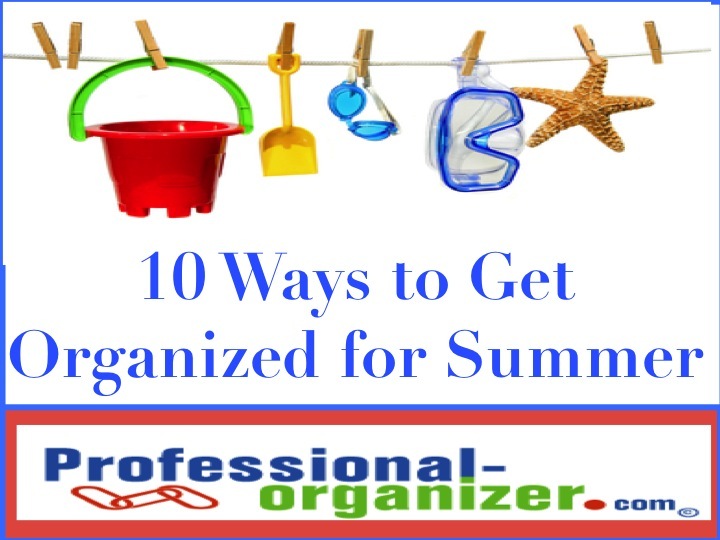 https://professional-organizer.com/WordPress/wp-content/uploads/2016/07/logo.png 0 0 Ellen https://professional-organizer.com/WordPress/wp-content/uploads/2016/07/logo.png Ellen2011-01-28 09:14:552011-01-28 09:15:08Weekend Warriors: Taking Care of your Car: My Vehicle’s Glove Box is Full of Paper! Help!